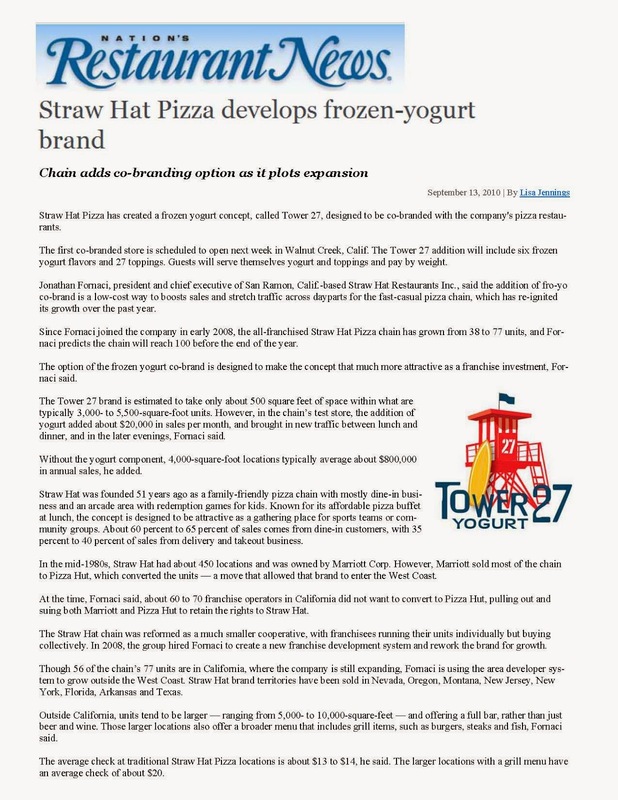 Straw Hat Pizza has created a frozen yogurt concept, called Tower 27, designed to be co-branded with the company's pizza restaurants. The first co-branded store is scheduled to open next week in Walnut Creek, Calif. 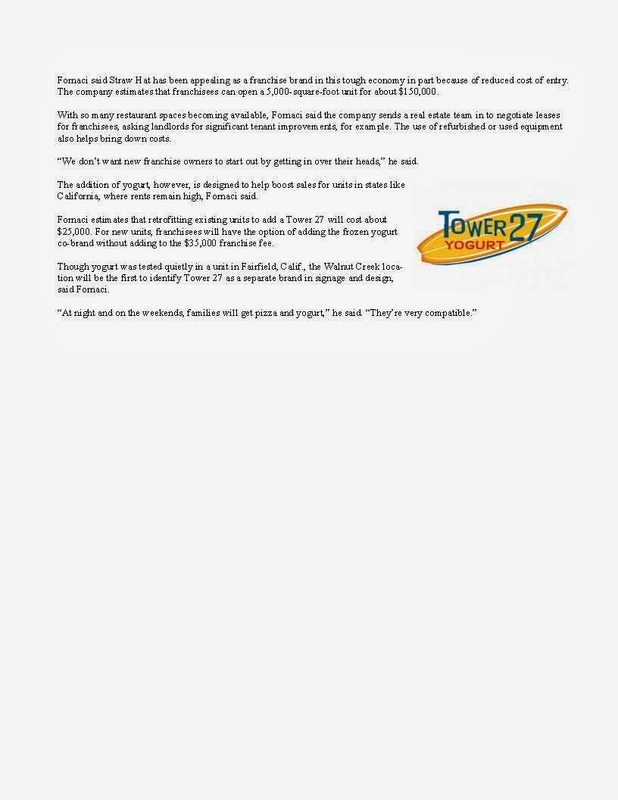 The Tower 27 addition will include six frozen yogurt flavors and 27 toppings. Guests will serve themselves yogurt and toppings and pay by weight. 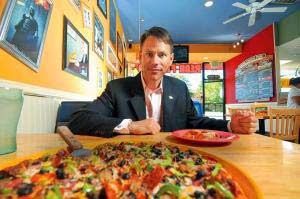 Jonathan Fornaci, president and chief executive of San Ramon, Calif.-based Straw Hat Restaurants Inc., said the addition of fro-yo co-brand is a low-cost way to boosts sales and stretch traffic across dayparts for the fast-casual pizza chain, which has re-ignited its growth over the past year. 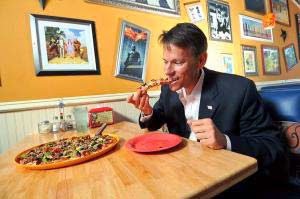 Since Fornaci joined the company in early 2008, the all-franchised Straw Hat Pizza chain has grown from 38 to 77 units, and Fornaci predicts the chain will reach 100 before the end of the year. “The option of the frozen yogurt co-brand is designed to make the concept that much more attractive as a franchise investment, Fornaci said. The Tower 27 brand is estimated to take only about 500 square feet of space within what are typically 3,000- to 5,500-square-foot units. However, in the chain’s test store, the addition of yogurt added about $20,000 in sales per month, and brought in new traffic between lunch and dinner, and in the later evenings, Fornaci said. Without the yogurt component, 4,000-square-foot locations typically average about $800,000 in annual sales, he added. Straw Hat was founded 51 years ago as a family-friendly pizza chain with mostly dine-in business and an arcade area with redemption games for kids. Known for its affordable pizza buffet at lunch, the concept is designed to be attractive as a gathering place for sports teams or community groups. About 60 percent to 65 percent of sales comes from dine-in customers, with 35 percent to 40 percent of sales from delivery and takeout business. In the mid-1980s, Straw Hat had about 450 locations and was owned by Marriott Corp. However, Marriott sold most of the chain to Pizza Hut, which converted the units — a move that allowed that brand to enter the West Coast. 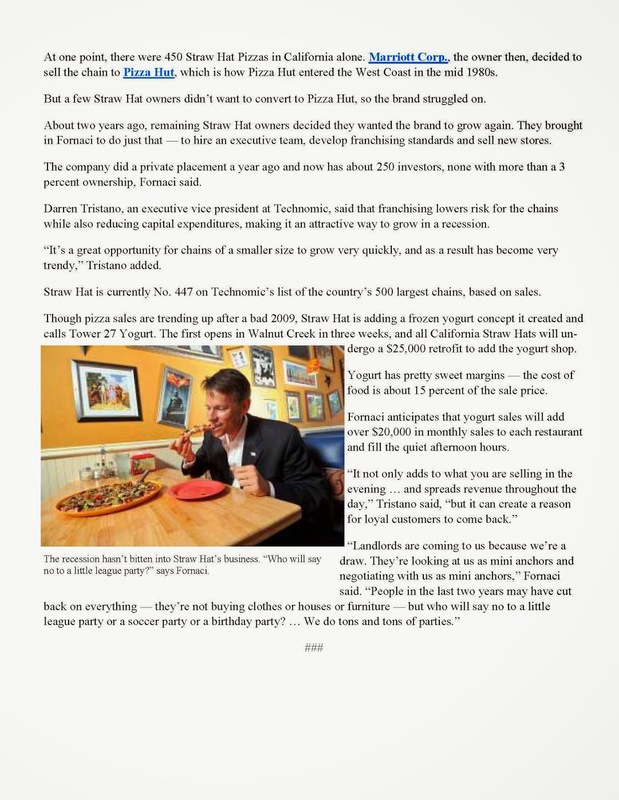 At the time, Fornaci said, about 60 to 70 franchise operators in California did not want to convert to Pizza Hut, pulling out and suing both Marriott and Pizza Hut to retain the rights to Straw Hat. The Straw Hat chain was reformed as a much smaller cooperative, with franchisees running their units individually but buying collectively. In 2008, the group hired Fornaci to create a new franchise development system and rework the brand for growth. Though 56 of the chain’s 77 units are in California, where the company is still expanding, Fornaci is using the area developer system to grow outside the West Coast. Straw Hat brand territories have been sold in Nevada, Oregon, Montana, New Jersey, New York, Florida, Arkansas and Texas. Outside California, units tend to be larger — ranging from 5,000- to 10,000-square-feet — and offering a full bar, rather than just beer and wine. Those larger locations also offer a broader menu that includes grill items, such as burgers, steaks and fish, Fornaci said. The average check at traditional Straw Hat Pizza locations is about $13 to $14, he said. The larger locations with a grill menu have an average check of about $20. Fornaci said Straw Hat has been appealing as a franchise brand in this tough economy in part because of reduced cost of entry. The company estimates that franchisees can open a 5,000-square-foot unit for about $150,000. With so many restaurant spaces becoming available, Fornaci said the company sends a real estate team in to negotiate leases for franchisees, asking landlords for significant tenant improvements, for example. The use of refurbished or used equipment also helps bring down costs. “We don’t want new franchise owners to start out by getting in over their heads,” he said. The addition of yogurt, however, is designed to help boost sales for units in states like California, where rents remain high, Fornaci said. Fornaci estimates that retrofitting existing units to add a Tower 27 will cost about $25,000. For new units, franchisees will have the option of adding the frozen yogurt co-brand without adding to the $35,000 franchise fee. 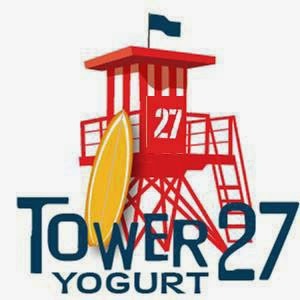 Though yogurt was tested quietly in a unit in Fairfield, Calif., the Walnut Creek location will be the first to identify Tower 27 as a separate brand in signage and design, said Fornaci. 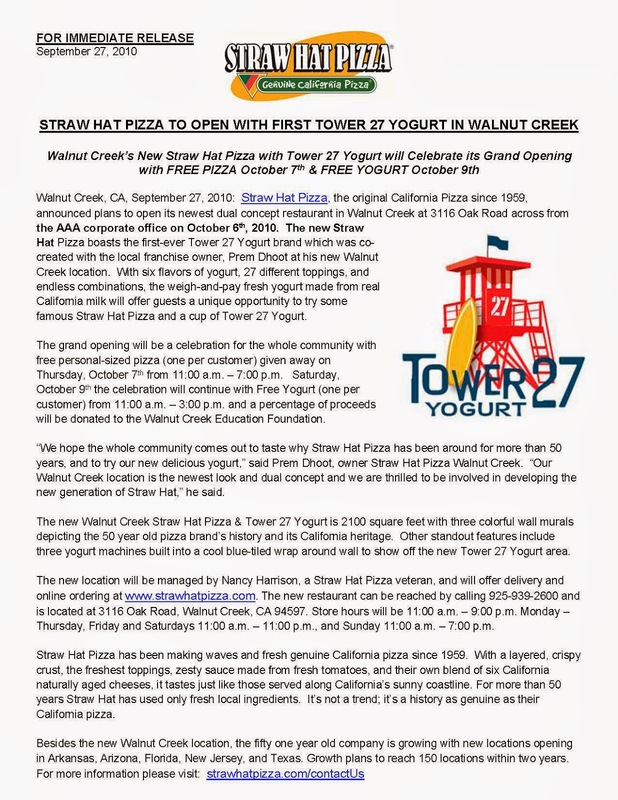 Walnut Creek’s New Straw Hat Pizza with Tower 27 Yogurt will Celebrate its Grand Opening with FREE PIZZA October 7th & FREE YOGURT October 9th. Straw Hat Pizza, the original California Pizza since 1959, announced plans to open its newest dual concept restaurant in Walnut Creek at 3116 Oak Road across from the AAA corporate office on October 6th, 2010. The new Straw Hat Pizza boasts the first-ever Tower 27 Yogurt brand which was co-created with the local franchise owner, Prem Dhoot at his new Walnut Creek location. With six flavors of yogurt, 27 different toppings, and endless combinations, the weigh-and-pay fresh yogurt made from real California milk will offer guests a unique opportunity to try some famous Straw Hat Pizza and a cup of Tower 27 Yogurt. The grand opening will be a celebration for the whole community with free personal-sized pizza (one per customer) given away on Thursday, October 7th from 11:00 a.m. – 7:00 p.m. Saturday, October 9th the celebration will continue with Free Yogurt (one per customer) from 11:00 a.m. – 3:00 p.m. and a percentage of proceeds will be donated to the Walnut Creek Education Foundation. 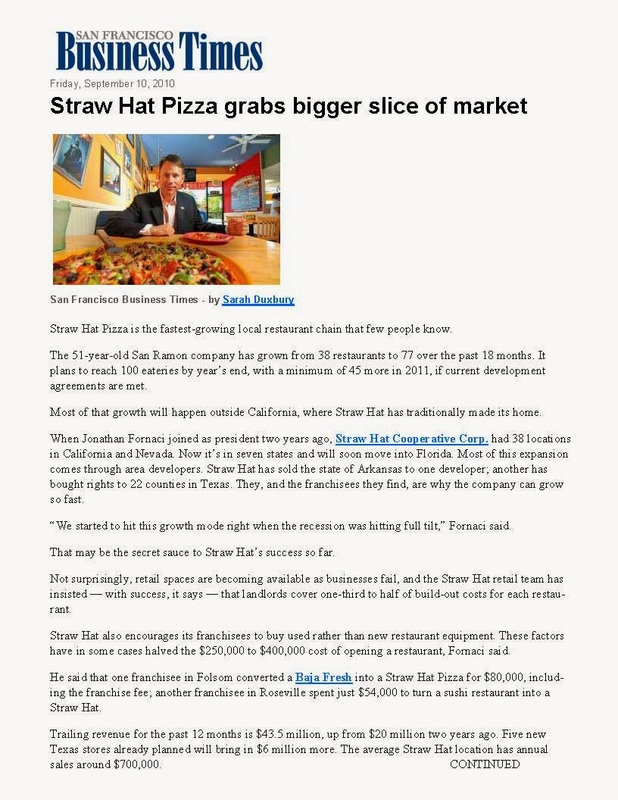 “We hope the whole community comes out to taste why Straw Hat Pizza has been around for more than 50 years, and to try our new delicious yogurt,” said Prem Dhoot, owner Straw Hat Pizza Walnut Creek. “Our Walnut Creek location is the newest look and dual concept and we are thrilled to be involved in developing the new generation of Straw Hat,” he said. The new Walnut Creek Straw Hat Pizza & Tower 27 Yogurt is 2100 square feet with three colorful wall murals depicting the 50 year old pizza brand’s history and its California heritage. Other standout features include three yogurt machines built into a cool blue-tiled wrap around wall to show off the new Tower 27 Yogurt area. The new location will be managed by Nancy Harrison, a Straw Hat Pizza veteran, and will offer delivery and online ordering at www.strawhatpizza.com. The new restaurant can be reached by calling 925-939-2600 and is located at 3116 Oak Road, Walnut Creek, CA 94597. Store hours will be 11:00 a.m. – 9:00 p.m. Monday – Thursday, Friday and Saturdays 11:00 a.m. – 11:00 p.m., and Sunday 11:00 a.m. – 7:00 p.m. Besides the new Walnut Creek location, the fifty one year old company is growing with new locations opening in Arkansas, Arizona, Florida, New Jersey, and Texas. Growth plans to reach 150 locations within two years. For more information please visit: strawhatpizza.com/contactus and please follow us on Facebook & Twitter @StrawHatPizza.